SATAminijet 4400 B HVLP 1.4 BASE. 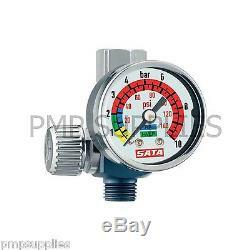 INCLUDING GENUINE SATA AIR MICROMETER REGULATOR. Supreme Flexibility The SATAjet 5000 B. Now painters have the possibilities to set pressure and distance as required by the paint to be applied, the climatic conditions and the work method to achieve perfect finishes. The design of SATAjet 5000 B has been created by the experts at the Porsche Design Studio who have translated pure functionality into aesthetic form together with the specialists at SATA. Due to the optimised shape of the gun handle, the spraygun fits perfectly in the palm of the hand. In addition, the gun handle of the digital version is identical in size to the standard model which makes it the perfect spraygun for all painters, regardless of the size of their hands. Our quest for excellent ergonomics however has not only influenced the development of the gun handle, but equally the design of the spray fan control, material flow control as well as the air micrometer. Robust but still low in weight, this spraygun offers a perfect combination of ease of application and durability. The SATAjet 5000 B is finished with a satin-gloss pearlchrome surface which is corrosion-resistant and easy to clean, as are the material passages, the quick change cup connection QCC and the sturdy QC air cap threads. Owing to the superb quality of the seals and other components, this spraygun is very low maintenance. Optimised nozzle for adjusting pressure and spray distance. Pearlchrome surface for easy cleaning, corrosion resistant. Easy to adjust control elements. Safely positioned trigger sleeve for easy, safe and quick insertion of paint needle. Swivel joint with new high performance seal. Identical compact-size gun handle for non-digital and digital guns. Optimised half-turn spray fan control. No adapter required SATA RPS disposable cups fit directly onto the gun for reduced weight and cleaning effort. Two ways to achieve a perfect result: HVLP and RP. The Super Saver SATAjet 5000 B HVLP achieves particularly high transfer rates, due to it low pressure technology. The Super Speed SATAjet 5000 B RP with its optimised high pressure technology for maximum application speed and minimum overspray. Both version are extremely versatile in application, meeting highest expectations concerning excellent finishes, while far exceeding 65% transfer efficiency rates in accordance with VOC legislation. Field of application: 0.5 bar 2.4 bar. Compliant: max 2.0 bar. Air consumption at 2.0 bar: 10.2 cfm. Field of application: 10 cm 21 cm. Recommended: 17 cm 21 cm. HVLP: max 2.0 bar. Air consumption at 2.0 bar: 15.2cfm. Recommended: 10 cm 15 cm. SATA RECOMMEND THIS GUN IS NOT USED WITHOUT A REGULATOR SO WE HAVE INCLUDED ONE IN THIS DEAL. The SATAminijet 4400 B is the perfect compact spray gun if you are looking for superb finishes on areas of difficult access. The special SR nozzles are perfectly suitable for spot repairs on vehicles. 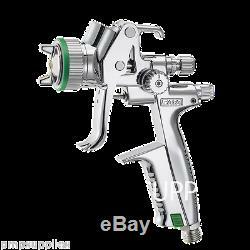 It goes without saying that this spray gun allows the application of all modern paint systems. With its new, ergonomically shaped handle, the spray gun is perfectly balanced. All adjustment elements can be safely operated even when wearing gloves. Furthermore, the design of the round/flat spray control is geared to the SATAminijet 3000 B. The spray gun is sturdy and long-lasting; the spray fan can be exactly adjusted with a 3/4 turn only. The spray gun body is equipped with a corrosion-resistant perloxal surface. The sturdy air cap is made of chrome-plated brass; paint needle and fluid tip are made of tempered stainless steel. The trigger protects the paint needle from overspray during painting, thus prolonging the lifetime of the paint needle sealing. The air piston rod has been especially reinforced. All these features result in an extended spray gun lifetime. The SATAminijet 4400 B allows the use of all three. Cup sizes with no adapter necessary. Furthermore, the large connection makes the cleaning of the material passages extremely safe and easy. AND SUBSCRIBE FOR NEWSLETTER OFFERS. See our Terms for details. Why not check out our shop? The item "SATA SATAminijet 4400 B HVLP Gravity Spraygun BASE 1.4 + Sata Regulator" is in sale since Thursday, June 22, 2017. This item is in the category "Vehicle Parts & Accessories\Garage Equipment & Tools\Air Tools\Spray Guns". The seller is "pmpsupplies" and is located in Liverpool, Merseyside. This item can be shipped worldwide.